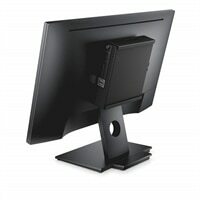 Dell OptiPlex Micro All-in-One Mount for E Series MonitorsThe Dell OptiPlex Micro All in One Mount has been specifically designed and tested to mount your OptiPlex Micro to the back of the Dell E Series monitors. By mounting your OptiPlex computer behind a flat-panel monitor, you can free up desk space, reduce clutter and keep your OptiPlex system out of view. The Dell OptiPlex Micro All in One Mount has been specifically designed and tested to mount your OptiPlex Micro to the back of the Dell E Series monitors. By mounting your OptiPlex computer behind a flat-panel monitor, you can free up desk space, reduce clutter and keep your OptiPlex system out of view.